I am reading Sorcerer's Stone to the Nanobots. Because they only pay attention to things that interest them, and they were a bit young for the movies when they were out, they are pretty much unspoiled, and it's been really fun listening to their reactions and predictions, so I thought I would share. We are currently in the middle of Chapter 10 — Oliver Wood has just introduced Harry to quidditch, and tomorrow night we'll get the read about the troll in the dungeons. Question from Mommy: Do you think Harry is right? Did Hagrid take the package out of Gringotts just in time and that's what the person who broke in was trying to take? Mommy: And that's what the big dog is guarding? Mommy: What do you think it is? Kilobyte: Voldemort's wand. Or maybe part of it. But it's something to do with Voldemort's power. Megabyte: It can't be a wand, the package is only two inches long. It's a source of power. Mommy: Who tried to break in? Both: Voldemort. 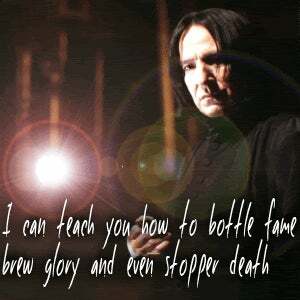 Or Snape, acting on behalf of Voldemort. Mommy: What do you think of Snape? What's his deal? Kilobyte: He's evil. He's Voldemort's servant. Megabyte: No, he was more than a servant. Mommy: Why does Snape hate Harry? Mommy: Is he coming back? Mommy: What do you think of Hermione? Megabyte: You like her. Because she's smart like you. Kilobyte: She's OK. She's smart. She doesn't like to break the rules. 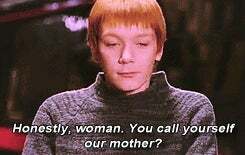 Harry and Ron should listen to her. Megabyte: He's not very good at potions. Kilobyte: But he did learn how to make a boil-CREATING potion! 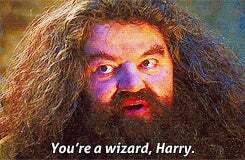 Kilobyte: Toads are really out of fashion, Hagrid says. And I think it would be really hard to keep a toad because it would keep hopping around. Megabyte: But it would fit in your pocket! Kilobyte: I would rather have a cat. Megabyte: I would rather have a creeper. Mommy: This is Harry Potter, not minecraft. Megabyte: Then I would want a dragon. Mommy: What do you think of Hagrid? Kilobyte: He keeps the mice in his coat to feed to the owls. And he's funny. Mommy: Because he gave Dudley a pig's tail? Megabyte: And he bent Mr. Dursley's gun. But I don't want to eat his rock cakes. What are rock cakes? Mommy: What house would you be in? Mommy: What house would I be in?